September comes to a close, and much to the delight of beer drinkers everywhere, October begins, marking the start of Oktoberfest festivities worldwide! And I Can't think of a better place in Metro Manila to Celebrate the German Tradition than the premiere German Bier Bar and Restaurant in the country.. Brotzeit! What is Octoberfest all about? Well, the highlight is Beer, of course! 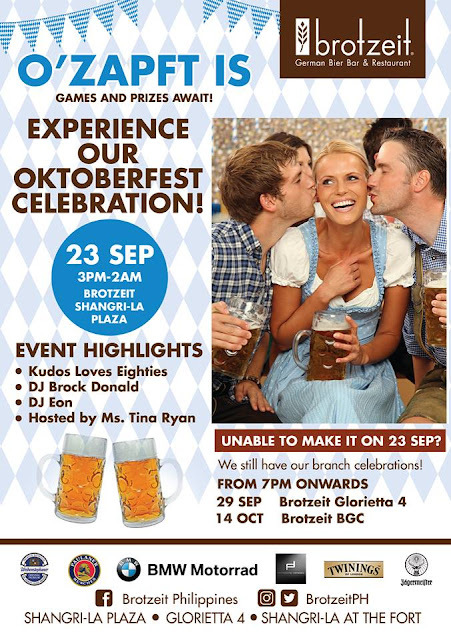 And Brotzeit has made sure their guests have plenty of it, by preparing personal kegs at Octoberfest friendly prices! The promo that has gotten everyone in a tizzy, is their Unlimited Flow of Oktoberfest Bier (P1,350), which is only available for the entire month of October! Check out the menu items that Brotzeit prepared for its customers in celebration of Oktoberfest! The Octoberfest Gemischeteplatte (P850) aka the "Octoberfest Mixed Board Platter" is filled with Assorted Cold Cuts and Cheese with Obatzda, and served with Breadsticks and Radishes. A dish that I couldn't get enough of, was the Klassische Berner Wurstel (P390). These were plump, juicy, Berner Sausages wrapped in mouthwatering bacon, then served on top of a bed of crisp French Fries. I was seriously contemplating stealing this plate and hiding it from my blogger friends, but in the end, I decided not to (Darn you, conscience!). For something heavier, you can have the Veal Goulash with Spatzle (P780). A mouthwatering traditional Braised Beef Shank Goulash, is doused in a vibrant Paprika Sauce, and served with a side of Buttered Spatzle. This was remarkably well balanced, as the creaminess of the Spatzle blended perfectly with the robust flavor of the goulash. Another amazing dish served to us, was the Schweinbauch (P490). This beautifully Roasted Pork Belly, was soft to the bite, yet the glorious looking skin lining it was remarkably crisp, and glistened in the gravy it was doused in. The Truffled Mashed Potatoes that it came with was also a delightful compliment to the dish. Sure, people go crazy over the beer when at Oktoberfest, but for foodies like me, the crown jewel of Brotzeit's Oktoberfestteplatte (P3,500 Good for 5-6 people). The Oktoberfest Platter is filled with some of Brotzeit's best sellers.. Such as the magnificent Beer Infused Bavarian Honey Ribs. This was truly outstanding, with the light sweetness harmoniously fusing with the light heat and natural flavor of the ribs. The Oven Roasted Pork Knuckle has been Brotzeit's signature dish, and rightfully so. It's uncanny how they managed to get the meat so tender, yet the exterior boasts of a stunning, crunchy skin. The Whole Roasted Chicken was also a sight to behold, with the bold flavors of the spice rub, bring to life the tasty flavor of the chicken. Another one of my favorites that evening was Brotzeit's new Meterwurst (ala carte P890). this 500g Sausage was extremely flavorful, and every bite was met with an explosion of cheese in your mouth. Yet another dish you MUST try when you're at Brotzeit. And finally, we ended our phenomenal meal with the Scheiterhaufen (P190). This delicious German Bread Pudding made with Rum, Raisins and is perched on top of a pool of luscious Vanilla Sauce. With it's amazing food and beers, you don't need to look for to find a fun filled place to celebrate Oktoberfest than Brotzeit!